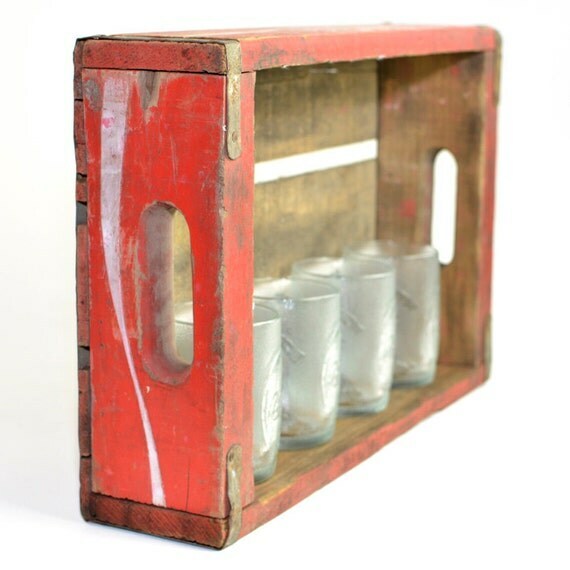 We’ve come across a stash of beautifully rustic old soda pop crates, and the ideas are churning for some awesome new upcycled items. There are so many amazing crate creations available on Etsy – the creativity is stunning! But we’re trying to stay off the beaten path with our crates in hopes of creating something totally new that hasn’t been done before. A one-of-a-kind gift set for the Coke lover in your life, or perhaps a great accent for the Man Cave! 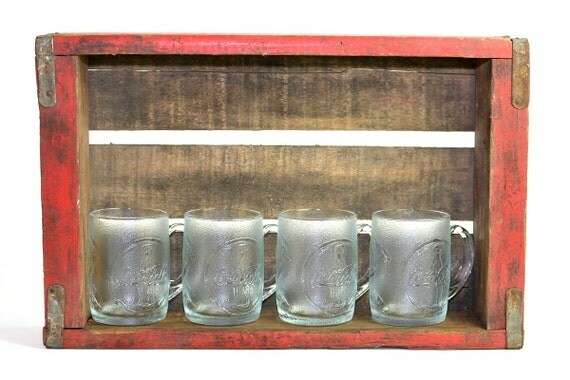 This rustic antique Coca Cola crate and matching heavy glass mugs will make a bold conversation piece in any vintage home decor scheme. 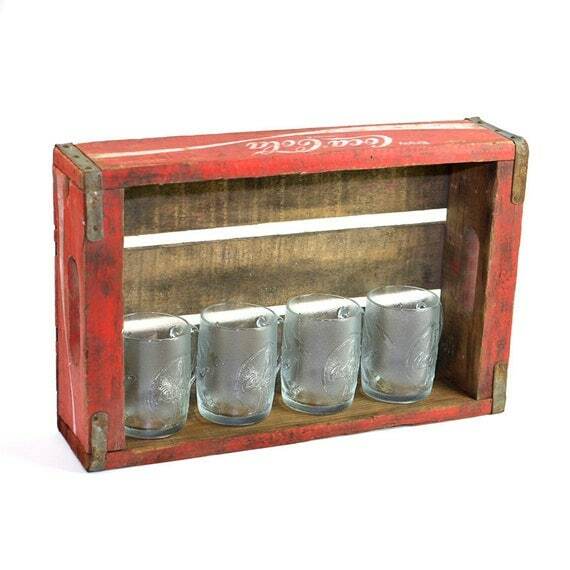 Old crates are so trendy and desirable because of their versatility! This crate can easily hang on the wall, as shown, and lined with the mugs for functional kitchen or bar shelving and storage. Or, lay it flat with your mugs and beverages inside to use it as a heavy-duty serving tray. From rustic decoration to functional use; from the Man Cave to a chic farmhouse wedding – the possibilities are endless! This particular crate is stamped on the inside with “Chattanooga, 1970”. It is in very rustic vintage condition, and has been in storage for more than 20 years. It’s dusty and grungy, with tarnish and rust on the metal side buckles and paint wear throughout, showing great character of age and stunning rustic charm! Pits, chips, scuffs, scratches, and even a doodle of permanent marker on one end – all the qualities of history show vividly on this piece. The important thing, however, is that it has retained its tough durability and solid construction through the years. This crate is still tight with no missing pieces. Crate measures 18″ long, 11.5″ wide, 4″ high. It can easily be mounted on the wall, but hanging hardware is not included. 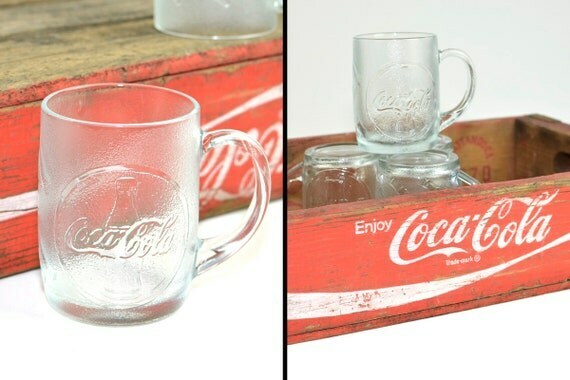 The four collectible glass Coca Cola mugs are included, as shown. These glasses are made of very thick glass – heavy duty and insulating too! Each mug features a frosted appearance, with the large Coca Cola signature logo and detailed bottle design on the front, and miniature Coke bottles lined on the back. For more funky upcycled creations, visit The Upcycled Collection in our shop! And stay tuned – we’ll have more new listings there soon! Upcycling is defined as “the process of converting waste materials or useless products into new materials or products of better quality or for better environmental value” (via Wikipedia). Last night, we introduced our newest shop section: the Upcycled Collection! 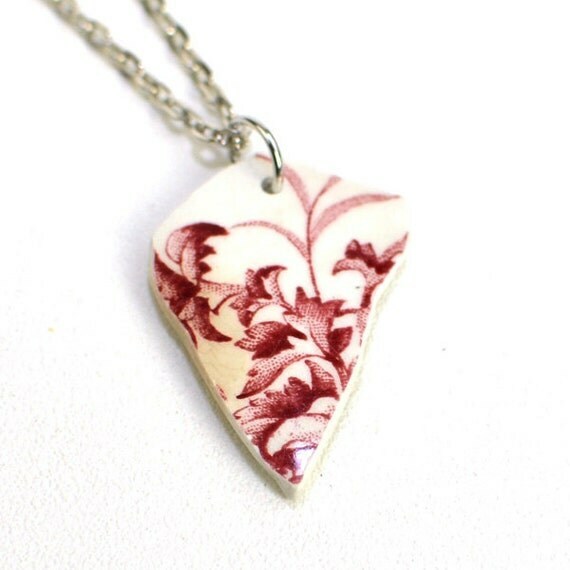 If you missed it, click and have a peek at 8 new upcycled pottery shard necklace listings! We are so excited to start listing our upcycled creations because it’s something we truly love to do. We’ve been gathering great vintage finds for so long now, and as you can imagine, we do come across broken or damaged pieces now and then… but we never throw them out! We stockpile them until an upcycling opportunity comes along! 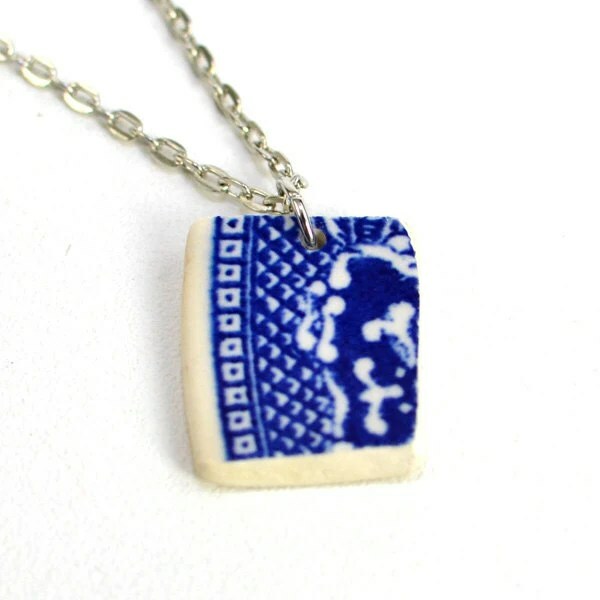 I made my first upcycled pottery necklace a while back. (Did you know I also have a handmade jewelry shop on Etsy? It’s another hobby of mine!) I loved the eco-friendly concept of recycling a broken piece of history into a unique statement necklace, and you wouldn’t believe how many comments (and then full blown conversations!) I got when I wore it. 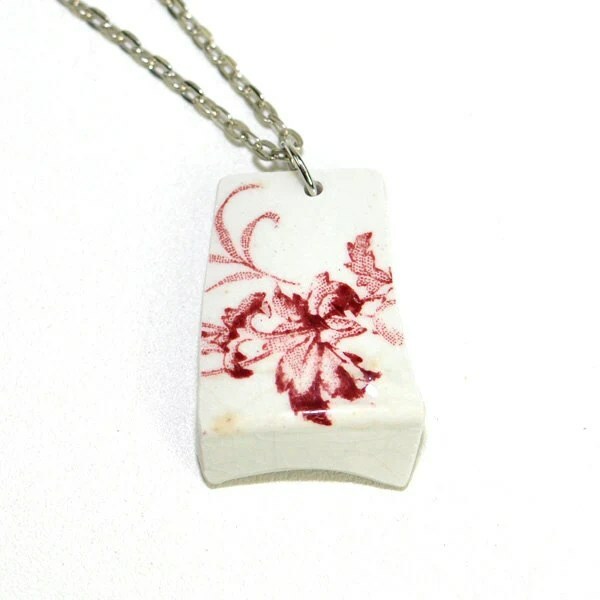 Since then, I’ve had requests for pottery shard necklaces and earrings from family and friends to use as gifts, and the idea of introducing this interesting jewelry line to One Rusty Nail was born. Arnold and I have been busy picking through our stock of broken pottery to find pretty patterns. We then further break the pieces down into usable sized shards. We spend some time with our Dremel tools, carefully sanding all along the perimeter edges of each shard for total soft smoothness, then drill a hole. I’ve been hanging the shard pendants on pretty silver tone chain thus far, but I’m considering branching into sterling silver, gunmetal, and copper chain with future pieces, as well as suede cord, or lace for chokers… the possibilities are endless! And YES, we’re taking custom requests and orders! To celebrate the launch of our Upcycled Collection and newly listed jewelry, we’re offering a very special coupon code valid for the next 48 hours – 25% off any necklace purchase! 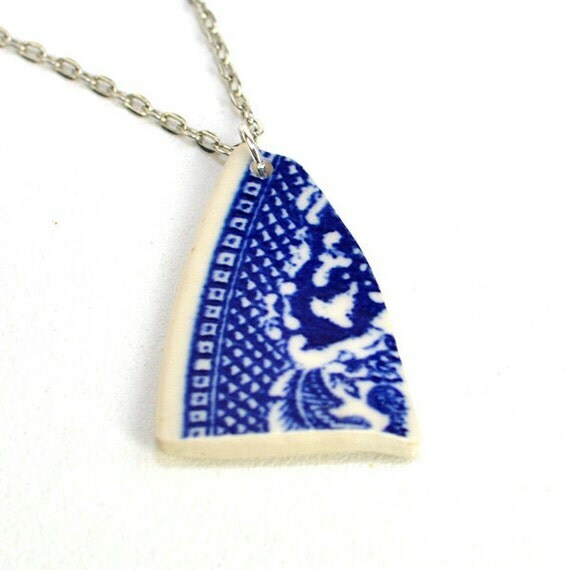 Just use coupon code NECKLACE25 during checkout to receive the discount! It only applies to our upcycled jewelry, and it’s only valid for the next 48 hours! We’re also offering FREE SHIPPING on any necklace when combined with any other purchase from our shop! And, receive a FREE NECKLACE with any total shop order of $100+! 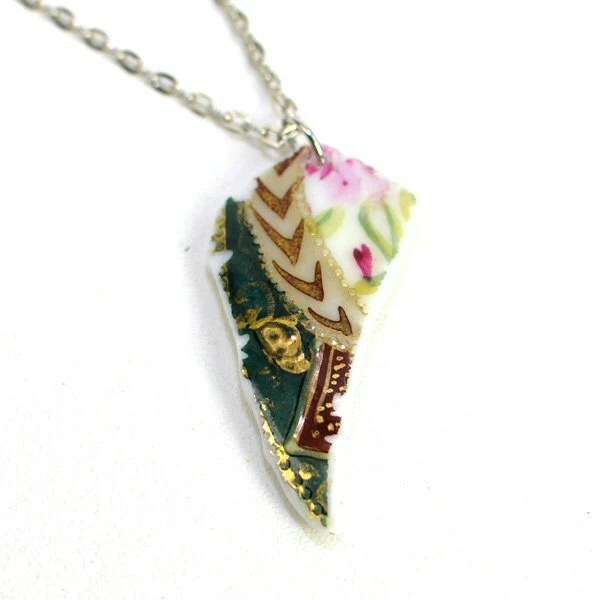 Stay tuned, I’ll be posting some historical background info on our newly listed necklace shards soon! As vintage lovers and collectors, we’ve come across our fair share of great antique treasures that are less than perfect. When we find a special piece of history that has too many imperfections to be enjoyed in its original form, we don’t toss it away – we upcycle! Cracks, chips, paint wear, repairs… when the condition looks too rough to feature the item in our shop as it is, you’ll find it in our Upcycled Collection! We’ve been upcycling, recycling and repurposing our vintage finds for our own personal pleasure, and we’re now proud to offer some of our favorites for sale in our shop. With our stock of vintage treasures growing by the week, you never know what we’ll be adding. We’re kicking off the collection with some fabulous upcycled jewelry, and looking forward to spending some time at the family workshop in the coming months with bigger projects in mind. 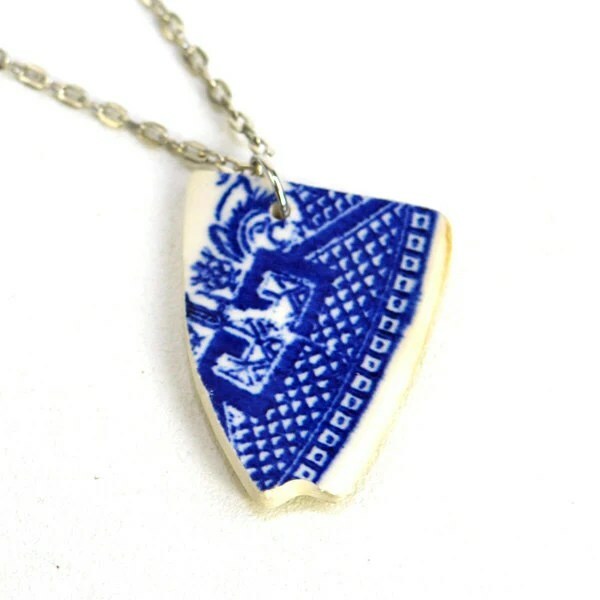 Have a peek at our newest listings – all upcycled pottery shard jewelry – now for sale at One Rusty Nail! Each shard pendant has been smoothed around the edges for a soft finish – no sharps! 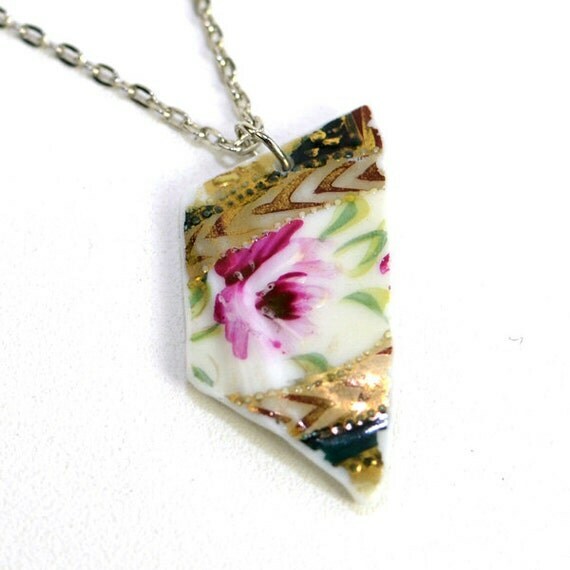 The shards are then drilled and hung on a delicate silver tone chain. Every necklace is unique and truly one-0f-a-kind! We ship our upcycled jewelry in gift boxes, ready for easy gifting! Each creation comes with an attached tag of historical information about the age, origin, manufacturer, and pattern as well! Keep an eye out – we’ll have more upcycled creations coming along soon!